KILLING THEM SOFTLY is an unrelentingly bleak and cynical examination of mid-level criminals in a bad economy. It chronicles an America bloated and decayed, with a soft belly and a smack addiction, where "hope you can believe in" is just a pathetic fairytale. America is a business not a democracy, and this movie is about getting paid. To that end, it is fitting that nothing that happens in this film is a surprise. The wheels of capitalism, whether on Wall Street or trashy motels, grind on regardless. The first act sees ex-con idiots Frankie (Scoot McNairy - IN SEARCH OF A MIDNIGHT KISS) and Russell (Ben Mendelsohn - ANIMAL KINGDOM) hired by The Squirrel (Vincent Curatola - THE SOPRANOS) to knock off a card game. The twist is that because the host of the game, Markie Trattman, (Ray Liotta) is known to have held up his own card game once before, the suspicion will fall on him and they'll get away scott free. The second act sees a dull bureaucrat (Richard Jenkins) hiring muscle to kill not just the guilty trio but also Trattman. For confidence to be restored to the "market", justice must be seen to be done, even if the underworld have gotten the wrong end of the stick. The bureaucrat hires Brad Pitt's hitman, Jackie Cogan, who in turn brings in James Gandolfini's Mickey, only to realise that Mickey is not fit for purpose. The final act sees Cogan resigned to the task at hand. There is a grim inevitability to the crime and punishment narrative. But that doesn't mean that the film has no dramatic tension. The initial heist is painfully, terrifyingly drawn out. And the final execution is expected but unbearably tense. I've never seen a punishment beating look so visceral as when Trattman is beaten by two goons. I've never seen an execution look simultaneously so beautiful and so desperately anonymous as when Trattman is off'ed. I've never seen a smack addict getting high so imaginatively depicted than when DP Greig Fraser (SNOW WHITE AND THE HUNTSMAN) photographs the perceptions of Russell. But we all know that director Andrew Dominik is the master of the technically brilliant set-up - the unbearable tense pregnant pause. That's partly what made THE ASSASSINATION OF JESSE JAMES BY THE COWARD ROBERT FORD an instant pantheon movie - and probably the best film I've ever seen at the London Film Festival. That film coupled stunning visuals and a foreboding mood with a sickening, fascinating obsessive love story. It had heart - a twisted heart, admittedly - but an emotional centre for us to hold on to. Similarly, Dominik's first film CHOPPER had audacious visuals and superlative editing, but it's success hinged on the charisma and horror of the central character. 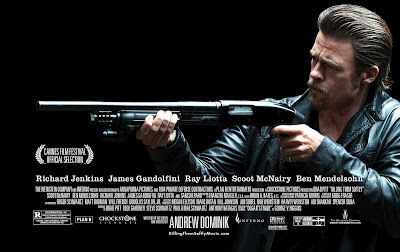 The problem with KILLING THEM SOFTLY is that it works at an intellectual but not an emotional level. This is quite deliberate. Dominik is making an intellectual point - about the decadence and squalor of the USA - the bad economy - falling wages, rising bureaucracy - that it's just about getting paid, and getting paid is getting harder. I didn't find the political analogy over-bearing as I know some critics have. I found it not just valid, but urgent. The problem is that the cynicism of the film is alienating - almost unbearably so. Dominik just doesn't give us anything to hold on to. And as a result, his latest film is less than the sum of its parts. KILLING THEM SOFTLY played Cannes 2012 and opened this weekend in Ireland, Spain and the UK. It opens next weekend in Slovenia. It opens on October 11th in Australia, Hong Kong, Italy and Argentina; on October 18th in Argentina, the Netherlands, New Zealand, Russia, Estonia and Lithuania; on October 25th in Greece; on November 1st in Portugal and Norway; on November 9th in Mexico; on November 16th in Poland; on November 23rd in Bulgaria; on November 29th in Germany and the USA; and on December 5th in Belgium, France and Denmark. While I loved the way you have analyzed the movie, I believe you have been a bit harsh in your overall assessment. I think Jackie Cogan's enigmatic persona forms the backbone of the movie. And the last scene wherein Cogan ridicules Thomas Jefferson and says, "America is a Business," for me, very much underlined the essence of the movie.